Chief of Police Lurie P. Poston stands with his police car on Broadway. Visible in the background is a liquor store that later became a garden shop and now Health Care Partners (right), as well as a small white building removed when the parking lot was added for Turner's IGA. To the right - Johnsonville Pharmacy and Venters' Department Store. Mr. Lurie Poston (1900-1973) was the son of Preston Poston and Julia Miles. He was born in Hannah and moved to Johnsonville in 1934, where he was both a merchant and a farmer. 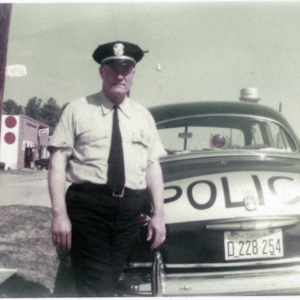 He served as Chief of Police for 14 years and Magistrate for 16 years. 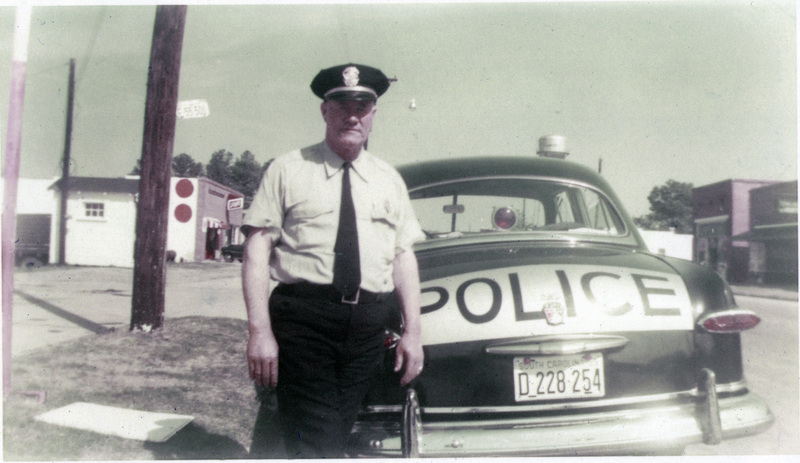 “Police Chief Lurie Poston Sr with police car on Broadway,” Johnsonville SC History, accessed April 19, 2019, https://www.johnsonvilleschistory.org/items/show/86.